This blog will be a shameless plug for my cousins start up business. Stephen has been researching and creating knives by forging a variety of steels and alloys into different blade types. 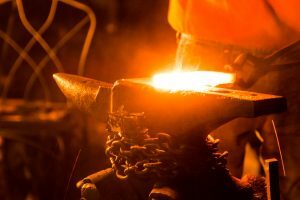 He heats the steel to a red hot temperature, pounds out and shapes the steel into beautiful blades, and then customizes the handle. It’s a super cool process to witness, so immediately I pulled out my camera and tripod to snap a few photos (below) for him. 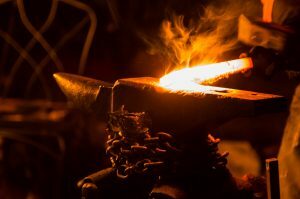 Blacksmithing is an ancient art form. Steve’s old school methods are similar to the the early Greek legends of the God Hephaestus. 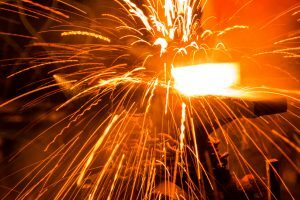 Hephaestus was the God of forging, metal working, and fire. In ancient lore, Hephaestus forged the great weapons of the Gods complete with an anvil, workshop, shaping instruments, and a team of lackeys to do his bidding. Of course, being the older and wiser (just kidding) cousin, I told him that he needs to get this idea and creative process of his out into the world. He enjoys this immensely and wants to make a business of it. Stephen is a bright young guy with an entrepreneurial spirit and lots of cool ideas, he just needs a little help molding these ideas into what could be a rewarding and profitable venture for him. If you or someone you know enjoys collectible hand crafted knives, is in the market for an unbreakable hunting knife, or just wants a special gift for a family member or friend, Stephen can be reached at Kratochvilst130@gmail.com or 412-530-5345. As always comments, questions, suggestions, and critiques are welcome!